Only today have I noticed that in one of my rather frequent layout changes of this blog, I’ve accidentally dropped the area where I share my bucket list items. I know the list by heart, and sometimes it’s better to think a little more in generalities, so it’s not a great loss. Such generalities for This Life include: marrying a good man, doing some downhill skiing now and then, making some sort of positive impact on the world, and having guests over to the house for dinner, regularly. I’m doing pretty good on the first three. Regarding the entertaining guests bit, as I wrote a couple months ago, I think we may trade in that one big yearly party for a having a few friends over for dinner, a few more times a year. Not only is the food and wine volume estimation a little more manageable, but as hostess, I have to flit less. Yay for longer conversations and more time seated! Just last weekend we had our friends Bill and Michele over to dinner. They are adaptable and adventuresome people, so we felt okay exposing them to a meal that included a recipe or two that was new to us, alongside an old standard. Note that the menu is more than one plate: I think this may be the first time we’ve done multiple courses for guests, beyond the cocktail-hour snacks. My rationale for the multiple courses: the tried-and-true base component of the meal was a very … brown dish. Well, “golden” is fair, at least for the top. 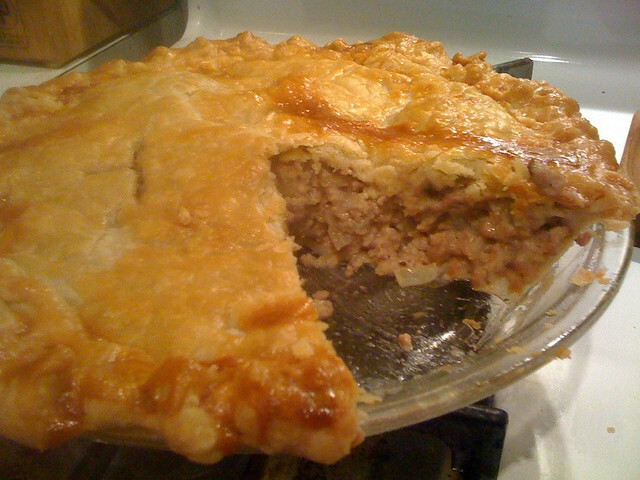 Pictured above, French Meat Pie is a very savory dish, and to its credit it does have a vegetable (onion) in it; two if you count the sage. It’s been the entire meal for us, on occasion. Still, on Saturday I felt compelled to get more colors onto the table, or at least, into the meal. Perhaps it’s due to my more recent endeavors to get more volume and variety of produce into us, or perhaps it’s just March in Minnesota and we are really, really tired of how white, grey and brown it is outside. Either way, our full menu got nine more fruits, veggies & seeds into the meal; 13 if you count the tiny amounts of olive, cilantro, ginger and limes that participated. The prep for the salad took the most effort: beets needed boiling; jicama needed peeling, slicing and marinating; and the raisins and Marsala needed some quality time together on the hob. The flavor & textures rewarded my effort, even if this course afforded our discovery that Michele is not a beets fan. I think our guests were most pleased with the soup, so I’ll share the recipe, with our modifications to the original, below. Back to the progress bit: we’ve already planned another dinner party: a dinner-and-games combo. Inspired by the recent announcement of TableTop Day, we’re planning an evening with another couple who enjoys board games. It’s long overdue and I’m excited to make it happen! Heat a medium saucepan over medium-high heat. Add oil; swirl to coat. Add onion; sauté 3 minutes. Add curry paste, garlic, and ginger; sauté 45 seconds, stirring constantly. Add broth and next 5 ingredients (through salt); cover. Bring to a boil. Reduce heat, and simmer 5 minutes, stirring frequently. Use an immersion wand blender to blend until smooth, if desired. Spoon about 1 cup soup into each of 4 bowls; top with 2 tablespoons peanuts and 1 tablespoon cilantro. Serve with lime wedges. Do you have friends over to dinner? How do you plan the menu?